If you run out of people to talk to, you are out of business. Yes, some people are just more social. And yes, some people are just more brave. But there is another problem- some people edit at the wrong time. Our brain cannot brainstorm and edit at the same time. If we try to do both, our brainstorming process gets shut down. This is why the best writers use a super rough draft to start. They get all the crazy ideas on paper, and then organize them. If you start evaluating ideas while brainstorming, your brain stops being creative. It’s bad for business. Here is how most people make a names list, “Ok Sally. Sally is great. She is really nice and she likes her health. I’ll call Sally. Mary. Mary is also nice and cares about her health. But she has 5 kids and is really busy, so I’ll call her at night. If I get a chance. Maybe I can call Carlie. Wait, no Carlie has a dad in the hospital she is too stressed to meet with me. I won’t call her.” And this goes on forever. Brainstorming and editing leaves you with a small list. And we leave out a lot of people. Do you believe in the life changing properties of your product? Then we have a moral obligation to share it with as many people as possible. Do you believe in the life changing properties of running a successful business? Then you need to prioritize your target market. But you don’t make your brain do these things at the same time. Here is the process I used as a Cutco manager to train new launches. I can’t take credit for this model, but I feel compelled to share it with you. Write down everyone in your phone who is 30-60 years old and you have not already done a 1-on-1 sales conversation with (or they aren’t already an active customer). So that’s probably almost everyone in your phone. Write them down, don’t question it. No filters. No editing. Cross of anyone who is a “no way on earth.” I’m not going to ask you to call someone you don’t want to talk to. This is your business, and you shouldn’t have to talk to people you dislike that much. Now we are going to use a star system. Each person can have a minimum of 0 stars and a maximum of 3 stars now that they are on your list. Put one star next to everyone who is nice. Put another star next to people who care about the core benefit your products provide. If you sell health products, put a star next to people who care about their health. If you sell make-up, put a star next to everyone who cares about their appearance. Put a star next to people with jobs. Circle your 3-star people. Those will be called first. Underline your 2-star people. They are still good options, just after your 3-star people. I probably wouldn’t be pegged by a network marketer as someone who cares about their health (my 6 asthma meds work just fine) or appearance. Yet I buy products in both categories. You focus on the potential customers who are most likely to buy. This increases your confidence and results. Also, who do they know? People like them. I have referred 3 people in the past week to my new accountant. Because I hang out with people who own businesses and have the revenue that makes them a great fit for my accountant. Win win. You don’t leave great potential customers out because you prejudge. I did this exercise in my workshop and there were people who were in the business for 5+ years who came up with tons of people that they need to reach out to. I have had clients in the business for 7+ years in a “saturated market” come up with people they had never considered. Why? Because when we work with the way our brain is wired, our brain works better. I hope this has been helpful and inspires you to take action! 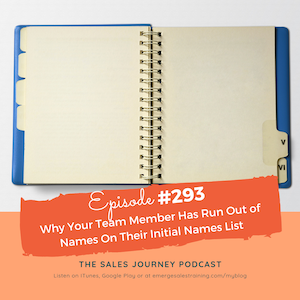 Let’s continue this conversation even further and talk about how to turn these name lists into rock solid appointments. Karen is getting together with a few people on Tuesday, December 4th at 10:00am PT/1:00 pm ET to talk about closing. You can register at emergesalestraining.com/freeclosing.